Do You Need a Smoke or CO Detector? Whether it's from a burning candle, a cigarette spark, cooking, or holiday lights, a fire can rip through your home almost instantaneously, leaving you only minutes to get out. That's why NBC Boston, necn, Telemundo Boston, Boston Fire and First Alert are bringing you the Fire Smart safety campaign. Click here to watch our special, "Fire Smart New England" with host Phil Lipof. It will also air on Wednesday, Nov. 22 at 8 p.m. on necn and on Friday, Dec. 8 at 5:30 p.m. on Telemundo Boston. The campaign includes hundreds of donated First Alert alarm installations at unprotected homes throughout the community. 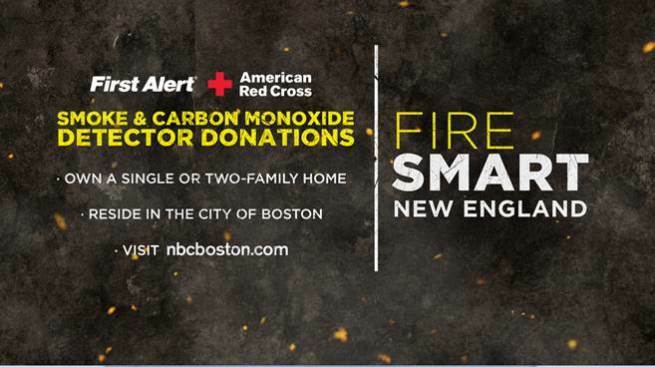 If you own a single- or two-family residence in the city of Boston and need a smoke or carbon monoxide detector and a home check, send an email with your name, street address, phone number and email address to programming@nbcboston.com.